Let me give you the Oriflame Business Plan overview today. In Oriflame you can join for free and buy more than 900 products of daily use on discount and develop a network of consumers. Oriflame brings a new Catalogue every month with new products, exciting offers and discounts for Oriflame members and customers. If you have a network of 100-150 members you can easily make around 50,000 per month. And remember joining Oriflame is free so you can quickly make new Oriflame consultants in your team. If you want to earn 10 lakhs a month just have 20 to 25 leaders who have a group of 200 people each and you can make 10 lakhs! How do you train them? I have made many audios and videos that I will share with you once you join my team and there is a lot of training I have made available online so just focus on duplication and earn money! Oriflame has completed 20 years in the MLM Business in India. 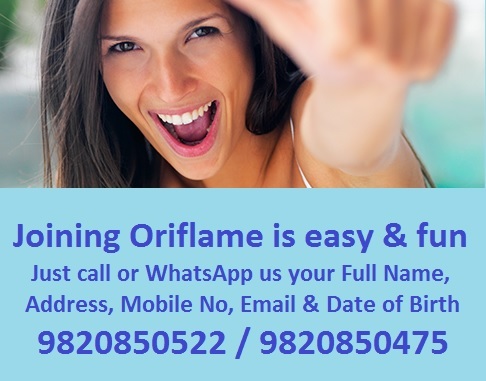 Oriflame is the No 1 Beauty Company and among the best MLM company in India. Oriflame has given 20% growth in business year on year. Oriflame has offices in Pune, Mumbai in Maharashtra, Hyderabad in Andhra Pradesh, Bangalore in Karnataka, Chennai in Tamil Nadu, Delhi - NCR, Ahmedabad in Gujarat, Jaipur in Rajeshthan, Kolkata in West Bengal, plus few other cities. Oriflame is a legal MLM Company in India and is part of IDSA. Oriflame is listed in Nordic stock exchange, etc. In Oriflame anyone can join for free. You get 20% on product sale and up to 22% on group sales. Oriflame has 900 products including many daily use products such as organic skin care products, shampoo, soap, hair oil, etc. all of international standard. Oriflame has all new technology to support distributors... including Oriflame online sign up form, Oriflame online ordering system called Cumulus, online reports of your downline, bulk email and sms software, etc. In Oriflame there is no 'capping' on your income. You can have unlimited directs and unlimited indirect downline and this is till unlimited generations. Oriflame is a global business so you can develop your business worldwide in 50 countries. Oriflame compensation plan, gives you more than 7 Crores in Bonus and minimum 4 Crore income in top position. In Oriflame there are cash awards at every step + foreign trips, etc as you progress. Oriflame gives many cars options including Honda City and BMW as you progress in leadership levels. Oriflame has the SARPIO Training System which is specially designed for building MLM business in Oriflame. Develop your team 1 time and enjoy lifetime.! If you have experience in MLM, you can become a Manager in Oriflame in 1 month and then progress to Senior Manager, Director and above levels. I hope this information was useful, to join the Oriflame Business call or WhatsApp Mrs Jashmi on 09820850522 or Sachin on 09820850475.